As far as eating out, food quality is excellent. We recommend Salsa Brava for its grill. Try the grilled tuna, Amimodo and the Pecora Nera for fine Italian dining. You will find local food at walking distance from the Tree House at Selvin's or Helena's restaurant. Both are experts in fish, lobster and other seafood dishes. Both places are good to try the traditional Rice & Beans, cooked in coconut milk. In Manzanillo, Maxi restaurant stands out with fish seafood cooked Caribbean style. 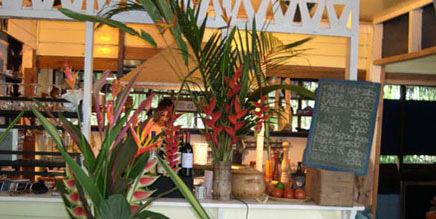 El loco natural in Puerto Viejo is the best choice for very good food while you are listening to live music.